Large, four-bedroom cottage on private beach. The cottage will comfortably sleep six people – perfect for a large family. 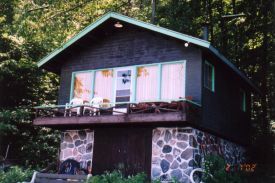 Amenities include a three-piece bathroom, woodstove, fridge, stove/oven, toaster, toaster oven and microwave. There are no laundry facilities on the property, but there is a clothing line. Also available on the property is a one-bedroom beach house, just steps from the shoreline. 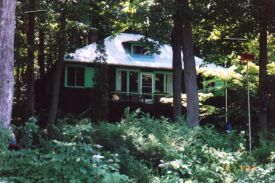 Both the cottage and beach house have access to a gas BBQ (there is one for each place), picnic table, hammock, bonfire pit, boat dock, paddle boat and lifejackets. We do not have current photos of the insides of the rentals, as they are currently undergoing minor renovations. Photos will be up shortly after we are done. For inquiries, e-mail is preferred.